Excellent performance at a good price makes this an easy recommendation. Adata's SX8200 Pro updates the controller while keeping the price lower than competing models. It's not the cheapest M.2 SSD, but it's very fast. SSD prices have plummeted during the past year, coming down from a major spike in 2017 to our current all-time lows. While it's hard to argue against the value of SATA drives when looking at our best SSD for gaming list—I did some testing of game and level load times and found everything from the top NVMe SSD to a slower SATA SSD fell within a 1-2 second margin—the tiny M.2 NVMe drives do deliver performance advantages. 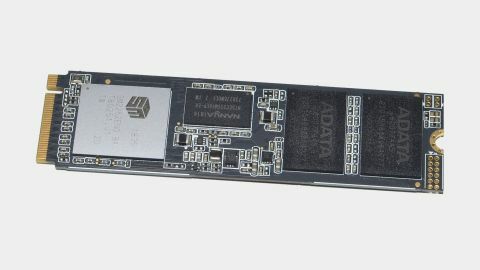 The best NVMe SSD will easily quadruple storage throughput compared to a SATA model, and while prices are still more than SATA models, they're getting lower. In fact, today a good M.2 SSD costs about as much as the same capacity SATA drive did one year ago. Adata is one of several companies that's challenging the notion that a fast M.2 NVMe drive needs to cost a lot. Its previous generation SX7000 and SX8000 drives were affordable but also relatively slow compared to Samsung's 970 Evo (as well as the earlier 960 Evo). That changed with the SX8200 series, which came relatively close to matching high-end drives on performance while still selling for significantly lower prices. The SX8200 Pro updates the earlier SX8200 (which was already decently fast) with a newer Silicon Motion SM2262EN controller. The new controller promises an "improved data path" according to the marketing material, and the specs jump from a maximum 1.7GB/s of write performance to 3.0GB/s, while maximum read performance only sees a small increase from 3.2GB/s to 3.5GB/s—though keep in mind 3.5GB/s is basically the maximum performance you'll get out of a PCIe x4 Gen3 connection. Adata gives the drive a 5-year warranty (which doesn't include data recovery, so you should still back up your important files! ), and the 1TB model we're looking at checks in at an impressive $210. Even better is that unlike the previous generation, which came in 240/480/960GB capacities, the newer SX8200 pro gives you 256/512/1024GB of storage. Again, that's thanks to improvements in the controller, but it means that as far as NVMe drives go, it's one of the better price/GB values, and when you factor in performance it's one of the best NVMe SSDs, full stop. Something I want to quickly mention before I get to the benchmarks is that I switched our SSD testbed over to an AMD platform last year, as the Meltdown and Spectre exploits—and more specifically, the patches to remedy them—reduced SSD performance, particularly for random IO. I saw significantly lower performance on Intel's Z370 and X299 platforms, but not on AMD's AM4 boards. Perhaps that's thanks to AMD including an additional four PCIe lanes from the CPU for the first M.2 slot, which is what I use for testing M.2 drives. More likely is that the exploits and their remedies simply didn't impact AMD's modern platforms much. Regardless, performance for all the SSDs was done on the updated testbed to ensure all results are up to date and directly comparable. Our overall ranking is based on the geometric mean of eight tests: IOmeter sequential and random; CrystalDiskMark Sequential and QD1 (read and write for each); file copying; and PCMark storage bandwidth. Our IOmeter sequential testing bandwidth is the geometric mean of full sequential 128kiB read/write mixes, stepping from 100% read/0% write to 0% read/100% write in 25% increments. Each mix runs for five minutes, so even drives with an SLC cache are likely to run out of cache and drop into 'minimum' performance mode. Our IOmeter random testing bandwidth is the geometric mean of full random 4kiB read/write mixes, stepping from 100% read/0% write to 0% read/100% write in 25% increments. Each mix runs for five minutes, and with fully random IO this represents something of a worst-case scenario for SSD performance. We time and calculate the MB/s for copying about 20GB of data (a Steam game folder) from the SSD to a different folder on the SSD. This taxes simultaneous read and write speed from the drive, though mostly in a sequential access pattern. PCMark's Storage test times a bunch of activities and then uses those results to generate a score. The bandwidth is more a look at how fast a drive is without the processing that usually happens in the background. Pure sequential read speed is effectively the best-case for most drives, though it still correlates well with things like game load times (though beyond a certain point all drives end up performing similarly for load times). Pure sequential write speeds show a best-case for writing data to a drive, which tends to be more complex than just reading data. QD1 random performance represents the workloads most consumer applications present to storage. This is why SSDs all tend to feel about the same when loading games. QD1 write results are much higher than read speeds, since caching and other factors come into play. Most applications don't do a ton of small writes, so this is more theoretical for desktop users (though it can be a useful metric for servers). QD64 random performance is often quoted by manufacturers, but it's mostly a meaningless metric, especially on desktop PCs. Most IO happens at QD1-4, and almost nothing gets beyond QD8. We present the data as a point of reference but do not include this in the overall score. As with the read performance, QD64 random write performance is often quoted by manufacturers, but it's mostly a meaningless metric. We present the data as a point of reference and to confirm manufacturer specs. QD64 performance is not part of the overall score. The overall PCMark 8 storage score uses the time to perform various tasks (loading games and applications, basically), but does not limit the workload to the pure storage speed. As with game load times, most SSDs 'feel' about the same and that's why the scores lump together around 5,000 points. Note that SSDs are still nearly twice as fast as a good hard drive. While we include the PCMark 8 Storage bandwidth as part of the overall score, the PCMark 8 score itself is presented merely for reference. Our value metric is the overall performance result for a drive (the first chart) divided by the price per GB in USD. This accounts for performance, capacity, and price in one metric, though it's still biased toward raw performance. Our value metric is the overall performance result for a drive (the first chart) divided by the price per GB in GBP. This accounts for performance, capacity, and price in one metric, though it's still biased toward raw performance. I've dropped older NVMe drives from the charts, and I've also included the top two SATA SSDs along with a state-of-the-art 4TB WD Black HDD for reference. If you're looking at pure performance, the fastest NVMe drives easily eclipse the SATA models, and the hard drive isn't even in the same solar system. Adata's SX8200 Pro ranks in the middle to upper regions of most of our benchmarks, including a few wins (or ties in tests like pure sequential read speed). More importantly, it does this with more attractive pricing than the competition, making it one of the best overall values. But what does that mean for gaming? As mentioned earlier, game load times don't generally improve a lot going from a decent SATA SSD to an ultra-fast NVMe drive. That's because in addition to pulling data from the drive, there's a lot of background processing that has to happen. Combine that with the fact that most games load data in more of a sequential fashion as opposed to pure random access—one of the areas where an otherwise empty HDD does best—and even spinning platters aren't the end of the world. But unlike putting the game on flash storage, there's a definite difference in load times: compared to 35 seconds to launch Assassins' Creed Odyssey and 20 seconds to load a save game, the hard drive takes 40 seconds to launch and another 32 seconds to load my latest save. Other games will benefit even more (and some will benefit less), not to mention how much faster SSDs are at tasks like copying files or verifying a Steam install. The real benefit for any SSD is going to be when using it as your OS drive. Unlike launching a game with little else happening in the background, booting Windows while loading your drivers and other utilities ends up being far more like a pure random IO workload. That's where HDD performance tanks, and it can get significantly worse over time on a hard drive as your storage gets fragmented. That's why solid state storage is so much better—access times are measured in microseconds as opposed to milliseconds. But what does the M.2 form factor give you, other than higher maximum throughput in some benchmarks? For gaming, it's definitely not a critical component upgrade—you'd be better off spending more money on your graphics card. For me, it's more about aesthetics, as removing the SATA power and data cables from your build makes for a more attractive interior. Plus, there's the knowledge that you have a fast enough SSD that it's not going to be the bottleneck in anything you're likely to do on a home desktop. That might not be worth the additional $50-$100 compared to a SATA drive for many gamers, but if you're building a high-end PC to last the next several years, I think it's money well spent.